Think the holidays are too busy? Make time for ZACH Theatre this holiday season. The cultural gathering place brings you a trio of holiday shows this season including the Austin premiere of the charming one-man show, This Wonderful life, the classic A Christmas Story and Holiday Heroes that all offer fun for all ages. The Austin premiere of This Wonderful Life plays thourgh December 29 on the Whisenhunt stage, starring Martin Burke of ZACH's The Santaland Diaries and Harvey. Based on the classic holiday film It’s a Wonderful Life, Burke plays all 37 characters in Bedford Falls including “George Bailey” a la Jimmy Stewart, “Mary,” “Clarence the Angel” and “Old Man Potter.” This comical romp underscored with tender sweetness is a joyous gift for all ages. It’s a can’t miss for fun. 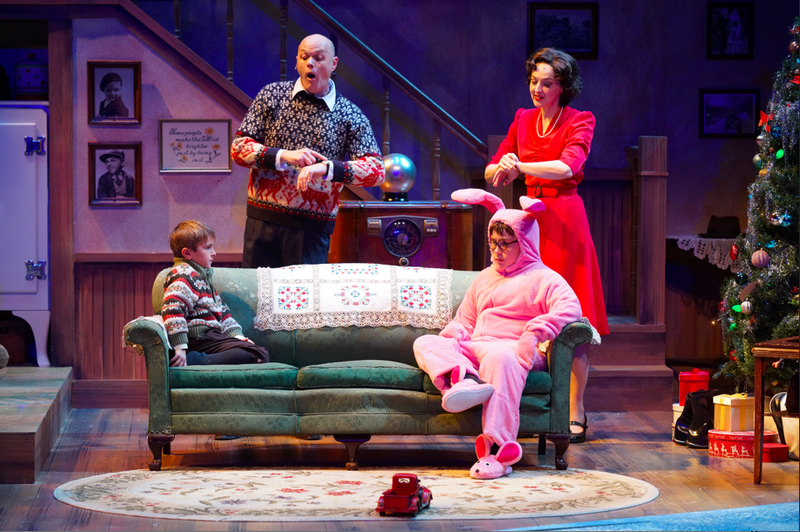 The Austin Premiere of A Christmas Story plays through December 29 at the Topfer Theatre. Based on the classic holiday film, young Ralphie and his quest for the Red Ryder B.B. Gun comes to delightful life on stage! Visions of pink bunny suits, tongues stuck on flagpoles, turkey-loving dogs and Pop’s beloved fishnet leg lamp will make all your family’s sugar-plum Christmas wishes come true. A Christmas Story is based on the motion picture of the same name. ZACH’s Family Series presents Holiday Heroes that is guaranteed to delight families and children ages three and up, playing two shows on December 7 and 14 at 11 am on ZACH's Kleberg Stage. The popular and hilariously fun Holiday sing-along show created by Shaun Wainwright-Branigan and Jerome Schoolar is in its 14th year! Our heroes, Ernie and Rufus are ready for the holidays when too much fun causes a raucous mix up of Christmas, Hanukah and Kwanzaa. Celebrate the season with singing, laughter and seasonal cheer for all. For more information, tickets for ZACH’s main stage shows are $25 to $70 available on-line at http://www.zachtheatre.org, by phone at 512-476-0541 ext. 1, or in person at the ZACH Theatre Box Office, in the Topfer Theatre, 202 South Lamar Blvd. (corner of Riverside Drive and South Lamar Blvd.) Monday through Saturday, 12 noon – 8 pm. ZACH Theatre is wheelchair accessible. Discounts are available for groups of 8 or more. Student Rush Tickets are $18 one hour before show time (with valid ID). ZACH’s full bar opens 90 minutes prior to show time and remains open for one hour post-show. Performances are Wednesday, Thursday, Friday, and Saturday at 7:30 pm, and Sunday at 2:30 pm.